Ready to work, but where are the jobs? Shadrack Okoth, 28, graduated in 2015 with a Bachelor of Arts degree in Environmental Studies from the University of Eldoret. For two years after his graduation, he worked as an intern and did voluntary work and other odd jobs for sporadic income, as he sought a permanent job in his area of study. But nothing was forthcoming. 21-year-old Yvonne Agnes’s story is a little different, yet it bears some similarities to Shadrack’s. She and her four siblings were left orphaned after their mother died in 2017, seven years after they lost their father. For three years after completing her secondary school education, Yvonne tried to secure employment, filling more job applications than she says she cares to remember. Their stories are a stark reminder of the reality faced by millions of unemployed men and women around the world every day, stories that lend credibility to a report released by the International Labour Organisation (ILO) in January this year titled: World Employment and Social Outlook: Trends 2018. Following its publication the report was highlighted in a story published by the UN News website with the headline: “Unemployment to remain high, quality jobs harder to find in 2018”. Unemployment and vulnerable employment remain some of the greatest challenges facing today’s economies, whether developed, developing or emerging. According to the ILO, as more people enter the labour market to seek employment, the total number of unemployed is expected to remain above 192 million in 2018, and that number would likely grow by 1.3 million in 2019. Yvonne Agnes, a beneficiary of Generation Kenya, listens in during the launch of Safaricom Foundation’s Wezesha programme. The three-year economic empowerment programme aims to provide training and entry level job placement to 1,700 young people. Kenya, like many other countries, has not been spared. Seven million Kenyans are reported to be lacking jobs, with nine out of every 10 of those unemployed being under the age of 35 years according to the Kenya National Bureau of Statistics (KNBS). Yet each year, about half a million youth graduate from the country’s universities and colleges. Of these, about 50,000 are absorbed into the formal sector. The rest either try their hand at entrepreneurship, find employment in the informal sector, go back to school to get further qualifications in the hope of securing increasingly elusive jobs – or remain jobless. In stark contrast, many employers say they struggle to find people with the right skills they need for entry-level jobs. “One of the major employment opportunities we see is in entry-level jobs, but a lot of young people who go into them don’t look to make a career out of them. They just want to get them as a holding job as they look for bigger opportunities offering higher pay,” says Sylvia Mulinge, a Trustee of the Safaricom Foundation. It’s an issue that the foundation is trying to tackle through increased focus on youth empowerment, one of the three pillars highlighted in its three-year strategy. The other two are education and health. Two weeks ago, on 8th August, it announced a three-year partnership with Generation Kenya to equip unemployed youth aged 18-35 years with the knowledge, skills and tools required to succeed in a job. Through Wezesha, an economic empowerment programme, Safaricom and Generation Kenya hope to position thousands of youth for personal and professional success by offering intensive job training in five fields: financial services sales, distributed sales, retail and restaurant services, sewing machine operation and customer service. 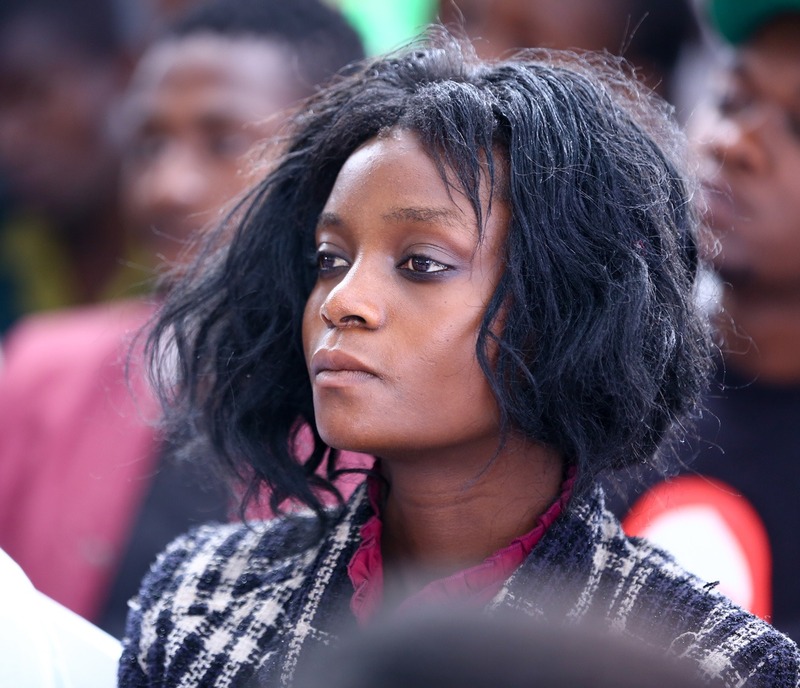 By targeting youth who, for some reason or other, have been unable to progress their education, and those who have been consistently unable to find employment despite their academic qualifications, Wezesha hopes to be a bridge between job seekers and employers. “Through working with Generation Kenya, we are looking to provide skilled labor for both the formal and informal sectors. Our ambition is to arm young people with the right knowledge, skills and tools that will help them succeed in the workplace,” says Ms. Mulinge. Generation is a non-profit organisation founded by McKinsey & Company in the United States in 2014, to help bridge the gap between employers and the 75 million unemployed youth around the world. Today, Generation Kenya is active in nine countries including Kenya, Spain, USA, Mexico and India, among others. Its mission; to empower young people to build thriving, sustainable careers, and to provide employers the highly-skilled, motivated talent they need, therefore creating real business value for employers and lasting career impact for participants. In Kenya, Generation Kenya has since 2015 graduated over 9,000 youth through 56 training locations distributed across 18 counties. 88 per cent of these youth have been placed in meaningful employment after undergoing training, including Shadrack and Yvonne. Shadrack heard about the programme from a friend while volunteering at a school in Kajiado last year. Desperate for a job and with nothing to lose, he moved to Nairobi to try his luck, enrolling for an eight-week Retail and Restaurant Services course at Generation Kenya’s Koyaro centre in Kibra. Soon after completing his training he was employed as a supervisor at Choppies Supermarket, along Nairobi’s Tom Mboya Street. 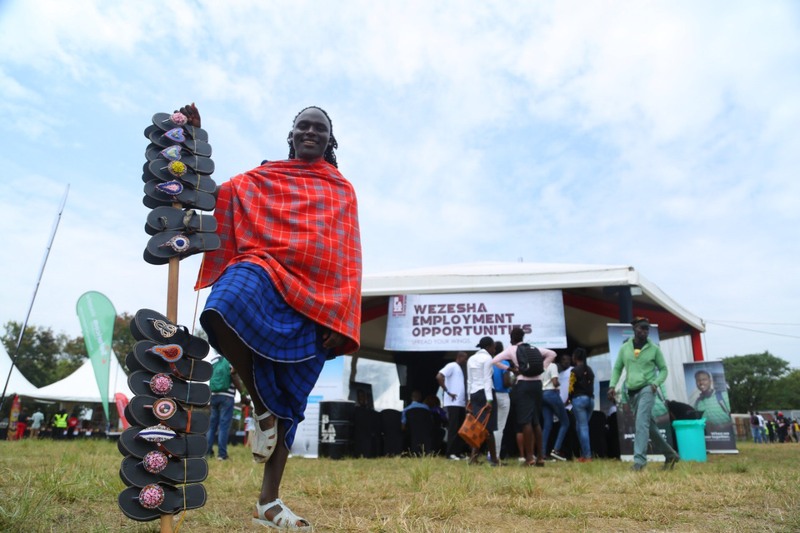 An entrepreneur displays his wares in front of the Wezesha programme pod at the recent BLAZE BYOB Summit held in Kisumu. “I did not feel overqualified to take an entry-level job in the supermarket chain. People graduate with big dreams. I was one of those people. But it is not easy to find a perfect job in your field. There is high competition and a tough economic situation in Kenya. There are no jobs,” says Okoth. “What I am doing is directly linked to my educational background: I am a social scientist in the retail industry. Choppies has a department of compliance and enforcement, and I look forward to being the manager in that department to fully utilise my knowledge and skills,” he adds. Generation Kenya has largely relied on word of mouth and testimonials to reach out to the youth, which is how Yvonne learned about it. She joined the programme in October 2017 and enrolled in the eight-week Sewing Machine Operator course offered at the Africa Apparel Centre in Nairobi. She was hired as a Sewing Machine Operator at the same centre after completing her training, and just two weeks into her job was promoted to the more advanced role of Machine Operator. According to Generation Kenya, majority of its graduates are employed within 90 days of completing their training, securing job placements from over 300 partner employers. It is stories and statistics such as these that Wezesha hopes to ride on to deliver a sustainable solution to Kenya’s youth unemployment problem. “Our partnership with Safaricom Foundation is critical in helping Generation Kenya grow its impact, reach more youth and grant them opportunities to learn skills and secure employment. With respect to this partnership, we will work with them to mobilize, screen and register 1,600 students aged 18-35 over the next three years, and ensure at least 90 per cent of students are placed into meaningful employment,” says Ramakrishnan Hariharan, Generation Kenya’s CEO. Employment is just one element of the solution. The Safaricom Foundation has also identified entrepreneurship as a way out of poverty for Kenya’s youth, complementing an analysis by the World Bank indicating that more young people aspire to become entrepreneurs. To address the mismatch between the youth’s entrepreneurial aspirations and opportunities available to them to turn these aspirations into reality, the foundation plans to work with more partners to support youth entrepreneurship and address constraints such as lack of access to start-up financing, exposure to networks, managerial and entrepreneurial skills, apprenticeships and limited information and capacity to take advantage of youth-focused government funds. It’s a small step towards solving one of Kenya’s biggest economic policy challenges, but for the 55 per cent of youth who remain unemployed (according to the Aga Khan University’s Kenya Youth Survey Report, 2016), it could be a step towards a future that has so far seemed out of reach. To learn more about Wezesha, visit: www.safaricomfoundation.org/wezesha/generation.